When you choose to install a patio, the first step is planning out the area. You’ll want your patio to be accessible, evenly shaped, and in the right area of your property. At Mr. Pavement, we can guide you in the right direction. Once we have the patio plan, we’ll outline the area and dig out the earth. Next, we’ll install a layer of base material and make sure it’s level. If you’re using solid concrete, we’ll line the patio area with wooden planks to create a border. Next, we’ll pour a layer of liquid concrete into the framed area. Once the area is filled, we’ll smooth it down so that it’s level. After that, the concrete will take around 48 hours to set and cure completely. Luckily, both concrete patio pavers and solid concrete are easy to maintain. The material is resistant to water, mold, mildew, rot, and more. Concrete can be cleaned with a stiff bristle broom, warm water, and a cleaner of your choice. In addition, both concrete patio pavers and solid concrete can be sealed for extra protection. When it comes to damage like cracks, divots, holes, or fractures, the repair process is different for pavers and solid concrete. 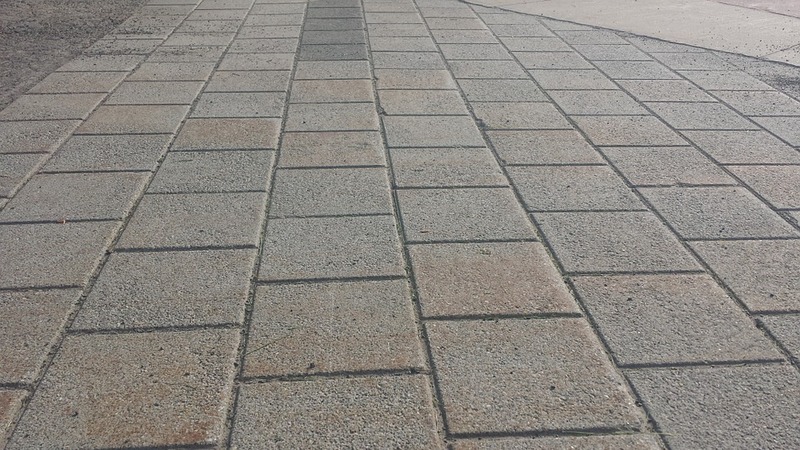 Because pavers are installed as small slabs or stones, a damaged piece can be removed and easily replaced with a new one. If your solid concrete is damaged, you may be able to fix the area with a patch. However, if the damage is significant, you’ll likely need to replace the entire patio area. Concrete patio pavers and solid concrete have two different looks to them. Pavers come in a variety of shapes and sizes, which means you can create a variety of patio patterns. Solid concrete, on the other hand, has a simpler, smoother look. Which look you prefer depends on where you’re putting your patio, the size of the area, your own personal style, and more. If you’re not sure which would be better for your home or business, don’t hesitate to ask the opinion of our paving professionals. Whether you’d like concrete patio pavers or solid concrete for your new patio installation, make an appointment with Mr. Pavement. We’ll create a beautiful hardscape that adds curb appeal and resale value to your property.